Do you crave homebrewed Kombucha? Love bottling your own handcrafted beer? Whether you're passionate about Kombucha, beer, whisky, soda, cider, kefir, vinegar and oil, vanilla extracts or any other number of tasty bottled treats, these are the glass bottles for you! Our 16 oz bottles are made from thick, durable, reusable glass so you can use and reuse them for all your delicious projects. No need to waste time and money on cappers and caps. Each glass bottle comes with its own built in flip cap. Our flip caps are made from sturdy steel and thick rubber gaskets to provide you with an ultra-tight 100% leakproof seal that will keep the contents of your bottle fresh and delicious. Rubber seal can be removed for easy cleaning. For more beer bottling fun, Ilyapa also offers 6 Packs of Amber Bottles and 6 and 12 Packs of Clear Glass Bottles. Makes great Christmas gifts. 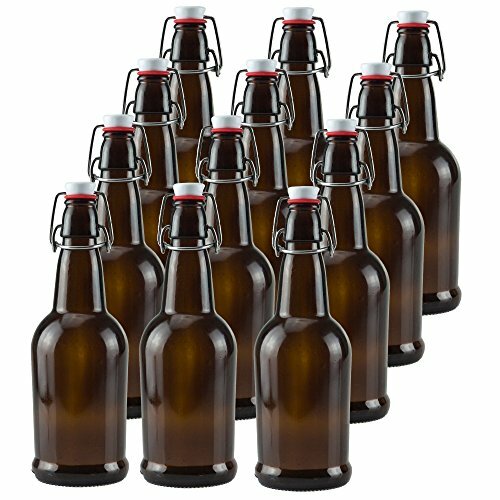 We know you'll love the Ilyapa 16 oz Amber Glass Beer Bottles for Home Brewing. Free shipping when you click "Add to Cart" and order today! "beer bottles brewing bottles empty beer bottles beer bottles home brewing 16 oz beer bottles 16 oz glass bottles beer bottles flip cap beer bottles home brewing beer bottles with flip caps empty beer bottles beer bottles for home brewing kombucha bottles 16 oz beer bottles 12 pack brown glass bottles glass bottles with flip homemade root beer kit 16 oz bottles with caps beer brewing kit 16 oz glass bottles beer bottles with flip caps beer bottles home brewing beer bottling 16 oz beer bottles bottles beer bottles for beer home brewing bottles brown beer bottles with lids 48 beer bottles 16 oz beer bottles for home brewing"
HEAVY DUTY GLASS - Our 16 oz beer bottles are made with durable, thick amber glass. Perfect for homebrewing, Kombucha, whiskey bottling, soda, cider, kefir, vinegar, oil, vanilla extract, and more. KEEPS CONTENT FRESH - The Flip Cap is easy to use and creates a tight seal, ensuring the content inside stays as fresh and delicious as the day you bottled it. AMBER COLOR is ideal for filtering light and protecting your home brew. COMPLETELY REUSABLE - Our durable glass beer bottles are built to last, so you and your loved ones can use and reuse them for years. PACKAGED SAFELY to prevent breakage during shipping. EXTRA-STRONG SEAL - The Flip Cap tops are made with sturdy steel and thick rubber gaskets to provide a super strong, leak proof seal, which helps preserve your homemade beverages, carbonation, or fermentation. 16 oz bottles. Case of 12. Amber Color.